So today we ran out the door, after his morning nap, to make it to the elementary school parade down Main Street at noon. Last year I tried to make it, but I totally missed it as getting him ready and out the door took longer than anticipated (2 month old new mom problems). This year we were only 19 minutes late. We saw the last two or three classes, which ended up being plenty considering it was in the 30's and snowing. Yes snow, which is to be expected living here (and what most plan their Halloween costumes around). Wyatt enjoyed pointing out the "Baba Jaga's", aka the Witches, plus some cats, and then trailing behind the kids was the fire truck, much to Wyatt's frozen delight. After the kids were done we quickly made our way to the Gap so I could get him a new set of mittens (I lost a bear paw earlier this week) and then we went to the library to read the last of the Halloween books on display (and get warm). Andrew and I had plans to take him trick or treating, but it's still snowing, plus Goose (Wyatt) fell asleep, and it is currently 39 degrees, feels like 31 degrees and like I said, it's still snowing. Had it only been cold, we would have gone for it, but cold and wet, we figure he will be fine skipping out. But he misses the treats you say? Oh don't worry, there is some bread with avocado and carrot ginger soup on the menu, which is practically like candy. You know, had we gone trick-or-treating, we would've just traded Wyatt the treats for apples anyway. Ah, the perks of being a parent, and having a toddler that doesn't quite know the difference yet. Since Wyatt is only 14 months, and can't quite articulate what he wants to be for Halloween, I decided on Frankenstein because he already had a sweater of his face. On Friday I realized he probably needs a hat, so I asked a friend for crochet needle, watched some youtube videos, went to my local yarn store and spent Friday and Saturday evening crocheting. I forgot to count and totally did not follow the guide, but somehow we got a hat. 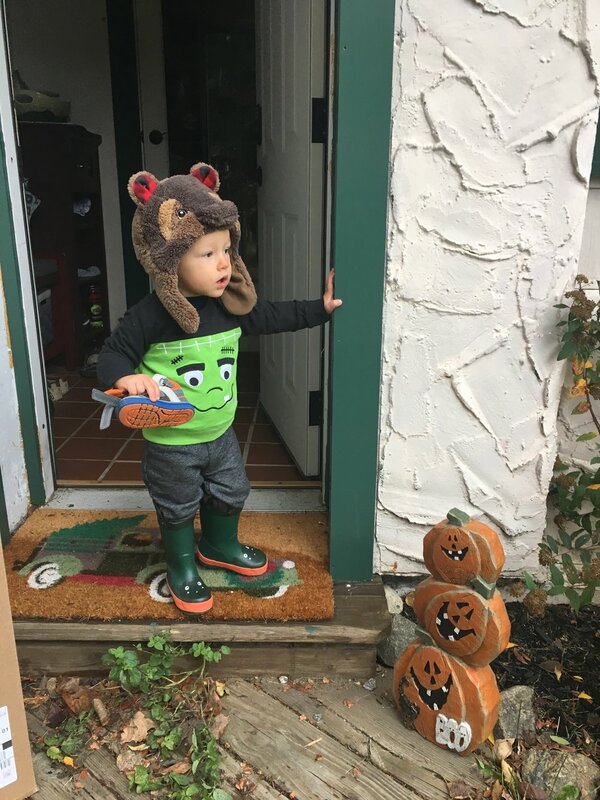 Of course it was so cold today we ended up having him wear a bear hat to keep him warm, but maybe with enough stretching, which Wyatt already does every time he pulls it off, the Frankenstein hat can be worn again next year. So with cold weather brings warm recipes. This Ginger Carrot Soup I technically make for Wyatt on a weekly basis, but you can certainly make it for yourself because it really is delicious. I sneak some bites while feeding him. Cut up all of your ingredients. Turn your stove on low and put coconut oil in a small pot. Once melted add the ginger & onion. Mix together and saute for 2-3 minutes. Next add the chopped carrots, mix and saute for 2-3 minutes. Follow this up with the red lentils and again saute for 1-2 minutes. Last add the water. It should cover everything and only just barely come over all of your ingredients (too much water and it takes forever to boil out). Stir and increase the heat to get it to a boil. Once it starts to boil take it back down to low and just let simmer, stirring occasionally. Leave to simmer for 25 minutes, or until the water steams out. SIDE NOTE: If your water has steamed out and the carrots are still hard, add more water and let it cook up some more. Hard carrots won't blend well. 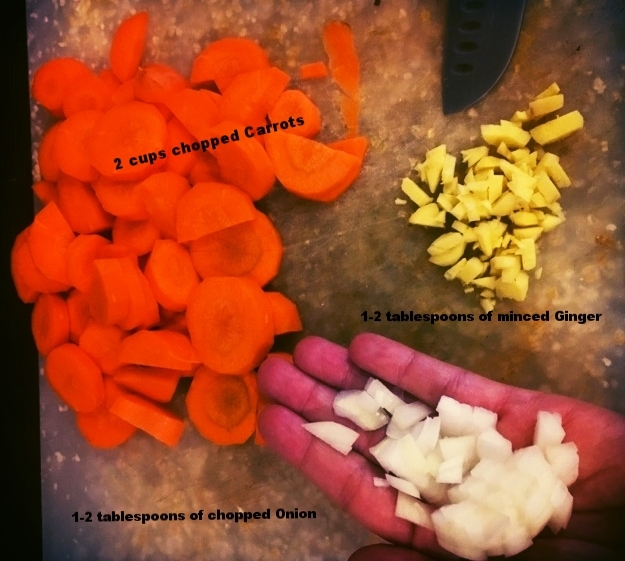 Once your carrots are ready, transfer the soup to a blender and blend up to a smooth consistency. I personally still break the entire soup down, since Wyatt swallows his soup without checking for actual vegetable pieces, but eventually I might just do a quick spin to leave some carrot chunks and more texture to the soup. And we're done. Should be about 4 servings. Well, maybe more, but for us it ends up being four because I give Wyatt 3-4 good table spoonfuls.